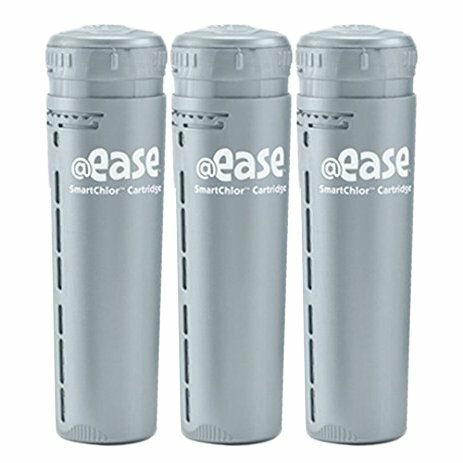 Replace your old spa filter with the new Spa Frog @Ease In-Line SmartChlor Cartridge. Hot Spring Spa filters are a vital part of any spa system. Spa filters regulate the water that enters your spa and keep debris, dirt, and other items from floating into the pipes and damaging the pump and inner workings of your hot tub. Chlorine replacement cartridge for Caldera In-Line @Ease sanitizing system. Includes three cartridges. Chlorine replacement cartridge for Caldera In-Line @Ease sanitizing system. Includes three cartridges. No matter the model of your spa or hot tub, or when it was made - it's important that you regularly change your filter to prevent bacteria build-up. Choose from our selection of hot tub filters to find the right replacement hot tub filter for your spa - at the right price! Hot Spring Spa filters are a vital part of any spa system. Spa filters regulate the water that enters your spa and keep debris, dirt, and other items from floating into the pipes and damaging the pump and inner workings of your hot tub. Hot Spring Spa Supplies carries spa fragrances, air & water valves, control systems, filter accessories, lights, cleaners, pumps, thermostats, and more for virtually every hot spring model. If you have any questions about this product by @Ease, contact us by completing and submitting the form below. If you are looking for a specif part number, please include it with your message.